← Yesterday’s Issues Addressed with Rolling Restart. WindLight First Look viewer released! We’ve just released the Second Life WindLight First Look viewer containing brand-new atmospheric rendering — killer skies and kickass environments — for your enjoyment! See our earlier WindLight announcement for more info. This viewer can be downloaded RIGHT NOW in Windows, Mac, and Linux flavors. What does “First Look” mean? “First Look” by definition is a “preview”. Some things are bound to be broken; we’re already aware of several bugs that need fixing. With your help, we can identify and reproduce further bugs so we can fix those, too. This also means that the included features are liquidly subject to change! As this is sort of a “sneak peak” of future technology which’ll eventually make it into the main Second Life viewer, we appreciate your help in getting things right. 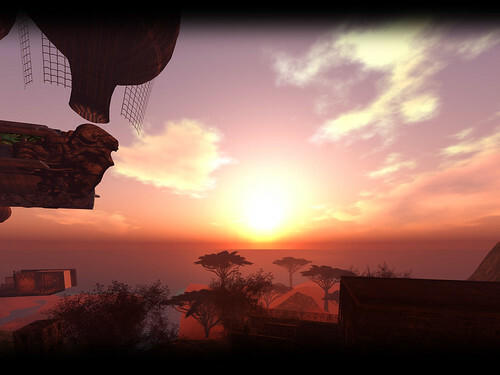 To emphasize, First Look WindLight runs on the MAIN, LIVE GRID, just like the regular Second Life viewer. This means SERVER-SIDE CHANGES ARE PERMANENT. So if you spend L$ or delete inventory, for example, those changes are not undoable. You’ll see them upon installing this viewer, and once you’re logged in, use Help menu > Release Notes. Will I need a more powerful computer to run WindLight? WindLight doesn’t change our System Recommendations, so if your system meets those, then you should be able to see the newfound beauty in all its glory. For the technically curious, this means that your graphics card should have DirectX shader model 2 or later support, and drivers that support GLSL. Check your graphics card’s manual or contact the manufacturer if you’re not sure. And if you don’t meet those requirements, CPU fallback will still allow you to see some of the new enhancements. Regarding “lag” concerns that came up earlier, we don’t anticipate there being a significant performance impact, as some of the calculations are actually more optimized than previously. So I logged in with First Look WindLight, what now? Go to World menu > Sky Settings. Next to “Key Frame Presets”, select another preset. Try several so you have a better feel for how it works. Then, you’ll want to explore further: click the “?” buttons next to each section to learn what it does, and start dragging sliders at your leisure. Watch the changes take place before your eyes, in realtime! Try tweaking settings in the Atmosphere, Lighting, and Clouds tab. The best way to enjoy is by doing, and experiencing. If you want to get even more advanced, try clicking the “Day Cycle Editor” button in the upper-right. This is where you setup your own custom animated day cycles, which can include any of the presets and extend over a given duration of time. A test day should already be loaded. Push the “Play” button. This user interface isn’t set in stone and has already gone through several iterations of design… keep reading for how to suggest improvements! Do you have more detailed documentation for this? Jeremy Linden and our Windward Mark team have put together fab WindLight instructions with helpful screenshots, currently residing on our Second Life Wiki. As First Look WindLight matures and becomes ready for release as part of the normal Second Life viewer, we plan to move this guide to our new Knowledge Base! These images are composited panoramas taken from raw inworld snapshots. Aside from that, no post-processing has been added. Can other people see the changes I make? Not yet — this is localized, or client-side, meaning only you will. In the future, we plan to allow estate owners and managers to change them, as a dramatic evolution of the current dayphase controls found in World menu > Region/Estate > Estate tab. Can I save my presets? “Save” button saves the whole list, not just the current preset. Related, there are inelegant user interface quirks we know about (e.g., you can’t delete presets, alphanumeric sorting is incorrect, etc.). Keep in mind we’re working on ways to share presets with other Residents in the future, so the current method of locally saving to an XML file is only temporary. Ultimately, this experimental section will be overhauled and streamlined in the weeks to come, so please don’t invest too much time in making presets. Our intention here is to give you a quick way to recall personal favorites. Set “Project” to “Second Life Viewer – VWR”. Set “Issue Type” to “Bug”. Set “Affects Version/s” to “WindLight” and fill in the appropriate details. Scroll to the bottom and click “Create” button. That’s it! You’ll probably want to bookmark issues you create so you can check them later. Only assign the “WindLight” component to issues that are directly WindLight-related. If you’re not sure, try to reproduce the same scenario in the regular Second Life viewer, and if it still happens, then you can use Tools menu > Bug Reporting > Public Issue Tracker. We encourage you to use the “Public Issue Tracker” option (instead of “Report Bug”), because we’re moving towards greater visibility of known issues and being more communicative about our work — aggregating that info in the Issue Tracker and openly showing how important it is to our Residents helps us be more responsive. Also, your fellow Residents will feel better if you report a bug first so they can comment and vote on it. This, among other supporting factors, helps us assess priority. See VWR-896 for an example. Thanks in advance for helping us help make your Second Life better! Should I use First Look WindLight’s “Report Bug” for WindLight-related bugs? Again, please use the Issue Tracker, where we have a special “WindLight” component setup for it. Makes it easier for us to find, and that’s important to you, right? How can I give feature feedback about WindLight? You can also use the Issue Tracker to do this. When creating a new issue, for issue type, choose “New Feature” instead of “Bug”. 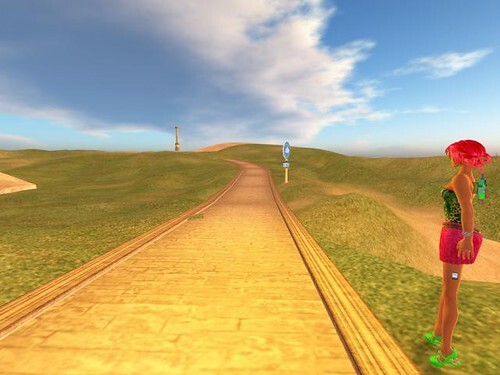 In addition to using the Issue Tracker, comments on this post are of course welcome — please keep feedback constructively focused on improving WindLight in Second Life — but due to time constraints, we regrettably aren’t able to reply to it all. We however will read your observations, and take them into consideration as we refine, reply to further questions, and eventually release WindLight for your Second Life’s day-to-day pleasures. What about an open source First Look WindLight viewer? We’re hoping we can share this in the coming weeks. No further details yet, but please stay tuned! Are there going to be future WindLight blog posts? This entry was posted in Announcements & News, Creativity & Ideas, Development, New Releases. Bookmark the permalink. 100 Responses to WindLight First Look viewer released! Please say this is a stable environment, no/low lag. Features are nice to have’s, stability is required. Woohoo, hopefully I can finally make rooms that are dark and aren’t affected by daylight. If not, at least it looks pretty darn spiffeh! I think perhaps you mean they AREN’T undoable? @Sean: I, uh, undid that, realized it was too much trouble to say “unundoable”. Thanks for spotting it, Brad Linden did too! If you’re taking hawt awesome screenshots with First Look WindLight, feel free to post links here, I am gonna share ‘em with my esteemed collagues. Ouch torley … this DL is … mega slow ? Feel free to remove this … i just wanted you to know this is VEEEEERRRRRYYYY SLOW ! looks good. looks like its new skymaps but still a change for the better. just wanted to get my word in before the blog trolls get here >_> cant wait for voice. Will this put back all the performance improvements that came with the original first look and have now been removed in the newest and laggiest ever client? @Lost: Pardon! We’re aware of slow downloads right now from a variety of geographical locations, 20-30 KB/sec seems to be the case. We’re investigating. This is a great improvement. Nice work! Going kinda slow but I’m downloading right now! Can we just go about SL normally in this viewer? If it’s nice maybe I’d switch to this one until it’s integrated on the normal one. After jumping in joy about 40 times in Foobar Salad (Katharine Berry’s sim, TG) I’m downloading it. Not that anyone was wondering :p , but I thought I’d mention that it’s not taking too long to download on my side, actually. Hmm, at default settings it looks…. “smoggy”. THe fog distance ratio doesn;t affect the new system everything is evenloped in a lumenexcent haze, meanting that EVERYTHING has changed colorto a slighyly bluish/purplish color. Playing around with te plethora of controls helps /some/ but… frankly the lighting model seems much less natural than before and I haven;t be an able to get rid of the copious amount amount of color change on everything yet. Some of us who’ve managed to get it downloaded and installed are getting errors that the installer is corrupted or the installed-software itself is corrupted afterward. All three people I know who’ve finished installing it are getting various errors when they try to run the new viewer. Ok, who do I have to talk to, and what do I have to do, to get LSL control of weather params so they can be altered temporarily by sim residents and visitors??? nooooooooooo! is the installer not compatible with vista? it keeps saying that it is corrupted and/or incomplete. after seeing those pictures,i want to download the first look veiwer soooo much! that was quick… from anouncement to release to first look…. WHOO! Whoopee! The Smiley’s now going to use this everyday just like the older one that had VBO ^.^ No matter how laggy it gets! I can’t even download – Must be my location (Israel). I’ll just wait for it to, “go-away”. Looking through the presets, the “Default” sems to be one of the worst, I think that needs to be tweaked to provide as close to “normal” lighting conditions as possible. 12pm seems close, I’d go for that as the default over what is now the default. Though avatars seem very very dark. Adjusting gamma so that avs look good makes evrything else blown out. ANd when everything else looks good, avs look dark. Nighttime lighting looks best, a lot of the day lighting just massivly filters all the textures with color shifts and lowered contrast reduction that are too severe. Though it’s nice to be able to go extreme, I think we may be lacking a bit of subtly here as well. This is exciting! I was hoping for voice today, but I can keep hopping on the beta to get my fix. As an estate owner with a very particular vision the future of windlight is making me *very* happy! Thanks, guys! LOTS of great new features! Speed problems fixed I believe – 85-90kb/s is pretty high for someone in Israel. I think these atmospheric effects will be an excellent improvement to the in-world experience, but is it really necessary at this time?? Please, DEAR GOD PLEASE! fix the existing problems first before compounding more bugs onto SL! You guys already have your work cut out for yourselves! SL is already a fantastic game. What are you trying to prove by adding so much candy with such a lack of regard for QoS? It’s practically insulting to those of us who pay you to be able to play this game when a huge amount of time is spent just dealing with bugs. Who is asking for more features, compared to who is asking for bugs to be fixed? I love to try new ideas too and it can be hard to resist. There is a motto in the programming trade, you guys SHOULD know.. “make it work, THEN make it better”. If you dont’ know that one already, you really ought to learn it. I suggest you pay more heed to the requests made by the recent Open Letter or you will find it is going to become a more and more frequent event. That negative publicity will outwieght any positive publicity created by these constant ‘improvements’. Can’t wait to see it! Flickr will be full with images tonight! Ohhh!! Now I can’t wait to get home and dl this !! Finally a graphics upgrade!! WEWT! Looks cool! But I bet this will be lag/crash tastic! Wow, simply and truly awesome, TOTALLY REALISTIC! With regards to downloads, has LL looked into possibly adding a torrent distribution? There are two ways to do this, one being simply post a torrent and seed, while the community will help seed and share as well. Secondly, add a “Bare-bones” torrent function to the client itself and while someone is attached to the grid they can share the latest (version they are using) with the community. Have it be an opt-in feature (Would you like to allow others to download the client from you?) that is minimal throughput, say 5K/s. 5K/s * 10,000 users = a significant amount of bandwidth if 30 connections can be made to download at once. Pingback: SecondLife - How To Make Money In Second Life » WindLight First Look viewer released! I got it working, but it looks ugly for me.. I tried changing the settings and nothing is helping.. I dont see any clouds and night time makes everything very white. So I’ve created a setting for “SL Normal” that gets somewhat close to the original noon lighting model. Saved it. Is there some way of sharing these setings with someone? I have not found the settings saved in an easy to find easy to copy in an email type location. Where are they stored exactly? and how? Also, looking at the timeline, it’s nice to be able to set a cycle, but what about random events? Should be able to set multiple settings per time with a random chance of each happening or something? Might be foggy one day, clear the next? That woud simulate real weather nicely. It downloaded for me in less than 30 secs(I have 4MB connection) and it rocks! Nice to see everything moving forward as linden planned. All the while losing even more inventory to some unexplained void area not understood by linden or the 6.8 million current user base. Wow, prettier graphics, nicer skies, flexible controlls, voice, and an inventory shrinking every time it gets touched. I think if Linden had to pay everyone back for the lost inventory items, you would see a decline in this madness. So far, I see no mention of fixed issues. All I am seeing is the willingness to advance regardless of what the user base asks for. I’ve yet to retrieve even one lost item since signing up. Maybe the future looks brighter for Linden, but no matter what is posted, the open letters, etc.., the vast majority looks to the blog to see a fix for inventory loss amongst the numerous other issues plaguing SL and have yet to experience it. Going on a year now with no fix. Aarh.. on *my* computer, what has a Intel 905 graphics chipset, the clouds don’t appear! The no Textures in edit mod bug is still there. But the sky looks fantastic. um… wait.. I’m a builder. May I have my textures please? It is capped at 50kb/s. Sorry… But it can help handle the load. ok I have to admit I would like you to fix problems more then add features but THIS is worth any problems it causes all I can say is WOW what an improvement. Working shockingly well and smoothly for me! Vista P4 3.07GHz system + Dell widescreen and a 6800 card here. ESPECIALLY love the cloud sliders and the distance / altitude sliders on the atmospheric effects, and the ‘add key’ settings on the day cycle. Scary how much better this is – And lag? what lag? No lag from it at all that I can see – in fact, might be less than the old cloud system? A very Happy Desmond whose only concern is that others don’t see what I am seeing right now. Pingback: MMODump.com » WindLight First Look viewer released! crashes and crashes hard on Vista with a Radeon 1600. I hope this wont be released as a mandatory update anytime soon! just says “Logging in” and its been like almost 5 minutes and it wont come up! If you want to accompany me for live chat about First Look WindLight, come inworld and join the “First Look” group. There’s a bug preventing some words from being searched, so go to Search > Groups tab, and search for “exchanging”; you can join it. I’m in the group IM right now. This is Hogwash. The place i built is only max 16fps in the sky with this viewer. With the main viewer 38-45fps. This dose in fact dramatically decrease the performance. I have spent weeks on this build to make it as Client lag free as possible. And this throws away all that hard work and planning! Oh and VBO enabling / Disabling crashes viewer. I will wright proper bug reports. Oh lastly, frame rate hit seems to vary run by run but is about 20% up to 50% on a quite high-end system. Hopefully that will be mitigated throughout the FL devleopment. i can´t tget further due to performance issues… waht to report ?!? textures not realy loading, or so slow (i would guess), that it may take 30-60 minutes if you don´t move. so basicly: but it in beta… its not even preview on typical european hardware. i wan´t think about the hardware we find (as a IT consultant) in major companys. NO RIPPLE WATER ? .. or is it just me ? This rocks … after just a few minz i come up with this .. Noticed the my multi gadget seems to emmit a transparent looking red texture .. allso may just be me . Uhm… Where is the moon? Ok, WindLight means pretty skies… if you’re standing on the ground. Fly up only a short distance and you encounter the flat cloud surface at around 750m. Fly above that and the sky suddenly turns a featureless black. If it remains like that, it ruins skyboxes (up to 768m), aircraft (up to 4096m), and skydiving (any altitude). PLEASE change this before putting WindLight into the regular SL client! Any chance of a blog about the major bug introduced with 1.16 which not only causes loss of an object on take but also results in the prim count not being released until the sim is rebooted? Or even better fixing it as quickly as you have brought out this new feature? Unable to log on using the first look. Getting “Unable to connect to version manager” error. Maybe should test a bit more rigorously first. Nice try though. Keep at it. As an SL skydiver, this is deeply worrying. the Sky totally cuts of at 768m, and anything above that just looks crap. If this gets onto main in its current state, it will *kill* Second Life skydiving and alot of aviation. It’s good to know a lot of feedback we’re seeing corresponds with what we anticipated and do plan to put back in the future, and severely improve. They, of course, include Wrestling and Cubey’s concerns — I’ve seen ideas tossed around for moonphases, multiple celestial bodies, etc., and you shouldn’t be able to fly out into the bleak blackness beyond the skydome. You sharing this with us helps reinforce their importance! I hope it works well for SL. Great? how is that going to bring back all my items that refuse to rez from inventory? The way I keep loosing stuff to the “object is missing from database” bug, soon all I’ll be able to do in SL is to look at the “new sky”. This is incredibly cool! I did notice that lighting effects seem to not be working and I had to once again turn on the full bright lag beast. Some particle effects seem borked too but all in all this is a wonderful feature!! Can’t wait to make a full spectrum of unusual skies for Gypsy! Crashing about every 20seconds to 1 minute on my ATI Radeon x700. Bit laggier as well. Seems to mostly happen if I try to look at the ocean. ‘Enable Vertex Shaders’ must be turn on. Very moody, this can change completely the way we feel in different places. I still think that it’s a bit like RGB’ing the monitor settings, i was imagining it more like the Bryce sky thingy. The unrezzed zones sometimes go a little weird, but the clouds are great and those particular settings like fog and colorful ambiences are way up there. very refreshing 🙂 thank you. can’t wait for that cloud shadow thing. @1: this IS going to be unstable for the moment. It’s a First Look viewer, and it’s offered for those of us who are willing to accept some instability (and downloads of frequent updates) to get an early taste of a new Second Life feature and to help make Second Life better. If you’re not ready to accept some level of difficulty, stay with the standard viewer for now. @25: no existing developers are being taken off bug fixing to do this. LL went and hired a whole team of new programmers — a company that has been working on this for the past couple of years. There would be no point to trying to reassign those people to fixing bugs in the existing code base; it’s not where their expertise is, and they would just quit anyway. I hope by this you mean that the sky won’t turn black above that height, and not that you’ll block travel above 768 meters. well i think its a step up from that crappy blue > black > orage > blue sky we had before i mean now it looks sorta real. My .0004 cents: everything here seems to work fine (I’m on Mac, almost brand new, but yeah). No real bugs I’ve noticed. I do have ripple water, moving clouds and normal performance. And, by the way, the first pics (after Torley’s, of course :p) are on Flickr already. Unusable for me, days and night cycles switch random without reason, no clouds beeing rendered, light is total off. Filed the issues at Jira. Same errors on both Linux (Ubuntu Engy) and Windows XP Professionel on GeForce 6800 GT with most recent drivers. Holy Cow that’s a sharp difference! Very nice effects. When the viewer first fired up it had Vertex Shaders off (default?) and that prevented my seeing any of the sky effects. I didn’t notice any increase in lag and my ram wasn’t siphoning away any faster so it’s a definite plus so far. This is fun, I really like the Ghost setting. I’m really looking foward to this update(a first =P)! However, you really need to fix your game up. The asset server is still slow, and things are still randomly dissapearing from people’s inventory. The updates are nice, but there’s also something we pay for called “maintenance”. If you have a laptop with a card that dosen’t support 2.0 will it work? I can’t update my driver because its a laptop. this is absolutely awesome ! ty so much for this feature ! in the actual version i had all graphics settings enabled (vertex shaders ect… and all sliders maxed) and had 30-32 fps in my test scene. thats a big hit and the test scene was pretty simple with few objects. when i switched off the vertex shader it ran with 27 fps and looked worse than the actual viewer without windlight (no sky at all). so please work on the performance issues LL! for me an update would mean worse performance and worse look. a big downgrade. and i think many residents have less powerfull computers than me. Looks awesome and for a change is lag-free. However, LL really should stop covering up their ‘horrible’ “maintenance” with updates and actually fix something rather than constantly coming out with something new thats also partly broken(although this update is unique and didn’t break anything. =)). Will it work at all with a laptop with GL1.4? I love it, just awesome! It makes some scenes so real with the new lighting, just awesome. ps: Did I mention it is awesome? The effects look cool. But settings are very complicated. Hope there are some simple defaults. Just a request. Alot of people have particle effects that depend on a DARK night sky. I sell particle effects that depend on darkness. In the past it has been very simple to set MIDNIGHT to see these effects. PLEASE make sure there is still a simple option to see good particle, lighted texture, and other lighting effects that people have spent alot of time and money to create and purchase. Re: bugs vs. features, I hope you all read the last section of the first WindLight post. Just to let you know! Fixed bugs, on our Issue Tracker, are broadly viewable. the ability to make total dark sims with hardware lights to lit stuff. Could make an excellent creppy sim that way….I guess. And ye, reset button like nr. 79 said. Oh and, sometimes the water effect seems to get messed up? Is wonderful!!! The light effect is cool. Just a few small issues, like: objects with bright don’t look right, and light from objects is not visible at night. The rest is wonderful! Getting all of 1 frame per second making this pretty much useless no matter how pretty it might look if I ever got to see anything. Re: shiny looking dull, known issue. So’s several crashing ones: crashing on Edit Land, toggling VBO, and possibly at login. Massive framerate hits are highly undesirable, make sure you report those with your system config @ http://jira.secondlife.com To get your system info while logged in Help menu > About Second Life, copy and paste that. It also helps to turn on Client menu (Ctrl-Alt-D) > Consoles > Fast Timers and attach a screenshot to your reported issue. We’ll let this valuable feedback of yours gel and compile further known issues in another promised blog update as THE SAGA OF WINDLIGHT IN SECOND LIFE CONTINUES! Thanks to each and everyone of you who’ve taken the time to try it out so far.